It is 1888. Rachell du Frocq and her family — her husband and five children, the only five who survived — have lived at their home in the Channel Islands, Bon Repos, for the past sixteen years. Bon Repos, ancient, warm, flowered and strong, is a bulwark, both against the wild storms of the Channel, and against the emotional storms, inside and out, that Rachell and André have weathered. They married young and wildly unsuited to the task of farming, and have gradually built a marriage and a home that is a living thing, fit to shelter love and children. But now Bon Repos itself is threatened. André is more of a poet than a farmer and cannot make Bon Repos pay. They are all going to be evicted, and will have to find an alternative: a soulless villa, with André working as a clerk, or worse, far worse, living with André’s father, a heartless and bitter old man. 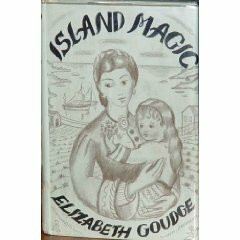 This is the backdrop of Elizabeth Goudge’s wonderful, satisfying first novel Island Magic. Into this desperate situation comes a shipwreck, and a shipwrecked man. Ranulph Mabier, cast ashore by one of the Channel’s fierce storms, comes to live with the du Frocqs through Rachell’s vivid insight that — somehow — he will save Bon Repos. At first, it seems quite the reverse. He is bitter and unpleasant; he has secrets; André dislikes him and Rachell is afraid of him. There is conflict in this restful place that has never existed before. But the children (Peronelle, Michelle, Jacqueline, Colin, and Colette) take to him immediately, and Ranulph begins patiently to work away at the knotted fabric of their lives: small problems of personality or psychological torment that have gone unsolved because Rachell and André have been so wrapped up in day-to-day survival. In the end, though, the triangle between Rachell, André, and Ranulph must be confronted — and even André’s father plays a part. Death and life meet and commingle. Love and redemption find a way to triumph. The ending of the novel is dramatic, even melodramatic, but never less than tender and sincere. I absolutely loved every word. One of the best things about Elizabeth Goudge’s novels (and why aren’t they better known in the United States?) is that her characters are so well-balanced. Rachell du Frocq is exquisitely beautiful, adores her children, and yet is insensitive to her husband’s artistic needs. Jacqueline is a prig, a tattletale, and a plagiarist, but when placed in the right context, she blossoms into someone gentle and happy. So it is throughout the book: love creates the environment people need to be their proper selves. And that’s the island magic. Though the pages teem with water fairies and other superstitions, the true island magic is the community, the love of family and home and church. Goudge does this so well. She takes her characters seriously, adults, children, and even dogs. Every new book of hers I read, I love her writing more. Give her a try (my very favorites are the novels about the Eliot family, beginning with The Bird in the Tree.) You won’t regret it. Well you convinced me! More to add to the wish list!! What a wonderful review! Rachel, I’m sure you’ll love it. For me, even a new (to me) novel by Goudge is certain comfort reading. For that review line alone, this book goes onto my TBR list. This is one of Goudge’s constant themes, in one way or another. Let me know what you try. I checked on our local library’s database. They have several Goudge books–unfortunately, not Island Magic, but they do have The Birds in the Trees, so I may try that one. Sounds really good. Not an author I’ve heard of either, but I’ll keep an eye out. Glad to bring her to your attention! Oh, I never even thought of that. What a fantasy! Oh, I so love Elizabeth Goudge! I have not even seen this one anywhere that I look, but I have a large number of her novels, usually in a lovely 70s paperback style. I recently read her autobiography, The Joy of the Snow, which was great. My ideal is to eventually have every one of her books. This is actually her first novel, as it turns out. I still have lots of hers left to read. What happiness!